Paul Kimmage, who won the William Hill Sports Book of the Year award in 1990 with the cycling claasic, Rough Ride, has been shortlisted for this year’s prize for Engage: The Fall and Rise of Matt Hampson, even though the acclaimed story of the paralysed England Under-21 rugby player was not originally submitted for the prize. This means the shortlist for this year’s ‘bookie prize’, the richest award of its type in the world, will consist of seven titles rather than six. William Hill spokesman Graham Sharpe explained: “Although the book had not been submitted for the prize at the time our longlist was announced, the members of our judging panel nevertheless agreed to consider it once it was brought to their attention. Also shortlisted is A Life Too Short, by Ronald Reng, which tells the tragic story of German national goalkeeper Robert Enke, who took his own life at just 32 years of age, as well as Racing Through the Dark, the controversial autobiography of British cyclist David Millar, and Among The Fans, award-winning sportswriter Patrick Collins's account of a year observing a range of different sports and their many and varied supporters. 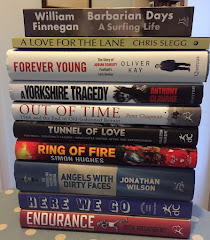 Now in its 23rd year, and with a prize worth £27,500 for the winner, the William Hill Sports Book of the Year Award 2011 shortlist covers a range of sports, including football, rugby, cycling, running and – more unusually – bullfighting.